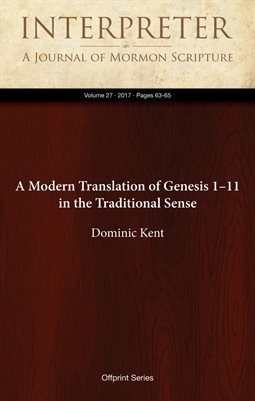 Samuel L. Bray and John F. Hobbins, Genesis 1–11: A New Old Translation for Readers, Scholars, and Translators (Wilmore, KY: GlossaHouse, 2017). 326 pages, $14.99, paperback. Abstract: Samuel L. Bray and John F. Hobbins have recently released a new translation of Genesis chapters one to eleven. The highlight of the work is their extensive notes that provide insight into not just their translation process, but on the process of Bible translation as a whole. The book offers a great deal to interest Bible readers, scholars, and translators.